^ Velasco, Dianne; Hough, Josh; Aradhya, Mallikarjuna; Ross-Ibarra, Jeffrey (1 December 2016). 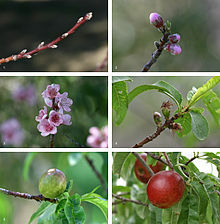 "Evolutionary Genomics of Peach and Almond Domestication". G3: Genes, Genomes, Genetics. 6 (12): 3985–3993. doi:10.1534/g3.116.032672. ISSN 2160-1836. PMC 5144968. PMID 27707802. ^ Linnaeus Carolus (1830). Sprengel, Curtius (ed.). Genera Plantarum Editio Nona [Plant Categories, Ninth Edition]. Gottingen: Dieterich. pp. 402–403. ^ Okie, William (July 2003). "Stone Fruits". In Janick, J.; Paulii, R.E. (eds.). Encyclopedia of Fruits and Nuts. C A B Intl (published 2008). ^ Armstrong, E. Frankland (1913). "Glucosides". In Davis, W.A. ; Sadtler, Samuel S. (eds.). Allen's Commercial Organic Analysis. VII (Fourth ed.). Philadelphia: P. Blakiston's Son & Co. p. 102. Retrieved 5 December 2017. ^ a b c Nile, Shivraj Hariram; Park, Se Won (1 February 2014). "Edible berries: Bioactive components and their effect on human health". Nutrition. 30 (2): 134–144. doi:10.1016/j.nut.2013.04.007. ISSN 0899-9007. PMID 24012283. ^ a b c d Cevallos-Casals, Bolívar A.; Byrne, David; Okie, William R.; Cisneros-Zevallos, Luis (1 May 2006). "Selecting new peach and plum genotypes rich in phenolic compounds and enhanced functional properties". Food Chemistry. 96 (2): 273–280. doi:10.1016/j.foodchem.2005.02.032. ISSN 0308-8146. ^ a b c d e Liu, Rui Hai (1 June 2013). "Dietary Bioactive Compounds and Their Health Implications". Journal of Food Science. 78 (s1): A18–A25. doi:10.1111/1750-3841.12101. ISSN 1750-3841. PMID 23789932. ^ Usenik, Valentina; Fabčič, Jerneja; Štampar, Franci (1 March 2008). "Sugars, organic acids, phenolic composition and antioxidant activity of sweet cherry (Prunus avium L.)". Food Chemistry. 107 (1): 185–192. doi:10.1016/j.foodchem.2007.08.004. ISSN 0308-8146. ^ Bastos, Claudete; Barros, Lillian; Dueñas, Montserrat; Calhelha, Ricardo C.; Queiroz, Maria João R.P. ; Santos-Buelga, Celestino; Ferreira, Isabel C.F.R. 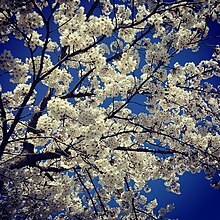 (15 April 2015). 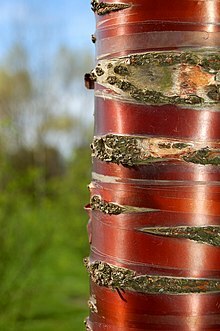 "Chemical characterisation and bioactive properties of Prunus avium L.: The widely studied fruits and the unexplored stems". Food Chemistry. 173: 1045–1053. doi:10.1016/j.foodchem.2014.10.145. hdl:1822/39810. ISSN 0308-8146. PMID 25466123. ^ a b c Lee, Bo-Bae; Cha, Mi-Ran; Kim, Soo-Yeon; Park, Eunju; Park, Hae-Ryong; Lee, Seung-Cheol (1 June 2007). 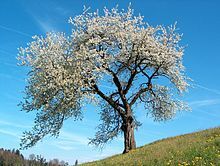 "Antioxidative and Anticancer Activity of Extracts of Cherry (Prunus serrulata var. spontanea) Blossoms". Plant Foods for Human Nutrition. 62 (2): 79–84. doi:10.1007/s11130-007-0045-9. ISSN 0921-9668. PMID 17577669. ^ a b c d Wijeratne, Subhashinee S. K.; Amarowicz, Ryszard; Shahidi, Fereidoon (1 March 2006). "Antioxidant activity of almonds and their by-products in food model systems". Journal of the American Oil Chemists' Society. 83 (3): 223. doi:10.1007/s11746-006-1197-8. ISSN 0003-021X. ^ De Souza, Vanessa Rios; Pereira, Patrícia Aparecida Pimenta; Da Silva, Thais Lomônaco Teodoro; De Oliveira Lima, Luiz Carlos; Pio, Rafael; Queiroz, Fabiana (1 August 2014). "Determination of the bioactive compounds, antioxidant activity and chemical composition of Brazilian blackberry, red raspberry, strawberry, blueberry and sweet cherry fruits". Food Chemistry. 156: 362–368. doi:10.1016/j.foodchem.2014.01.125. ISSN 0308-8146. PMID 24629981. ^ a b Hegedú´s, Attila; Engel, Rita; Abrankó, László; Balogh, Emó´ke; Blázovics, Anna; Hermán, Rita; Halász, Júlia; Ercisli, Sezai; Pedryc, Andrzej (1 November 2010). "Antioxidant and Antiradical Capacities in Apricot (Prunus armeniaca L.) Fruits: Variations from Genotypes, Years, and Analytical Methods". Journal of Food Science. 75 (9): C722–C730. doi:10.1111/j.1750-3841.2010.01826.x. ISSN 1750-3841. PMID 21535583. ^ Sochor, Jiri; Zitka, Ondrej; Skutkova, Helena; Pavlik, Dusan; Babula, Petr; Krska, Boris; Horna, Ales; Adam, Vojtech; Provaznik, Ivo (7 September 2010). "Content of Phenolic Compounds and Antioxidant Capacity in Fruits of Apricot Genotypes". Molecules. 15 (9): 6285–6305. doi:10.3390/molecules15096285. PMC 6257765. PMID 20877223. ^ a b Stockey, Ruth A.; Wehr, Wesley C. (1996). "Flowering Plants in and around Eocene Lakes of the Interior". In Ludvigson, Rolf (ed.). Life in Stone: a Natural History of British Columbia's Fossils. Vancouver: UBCPress. pp. 234, 241, 245. ISBN 978-0-7748-0578-0.